Welcome to the alternative site of Wood You Like Ltd - this site will act as default when our main site is - for what ever reason - offline. Here you'll also find our online shop for everything your wooden floor needs to be healthy and beautiful for the longest time. "We got a reddish coloured floor in our house and want to lighten the colour - how do we go about this?" To be honest, more often than not we tell them it would be a shame to change the wonderful natural colour of the wood-species. Once we inform them of the nowaday prices of tropical wood floors most are then (although some reluctantly) changing their minds. Restoring a original tropical wood floor will add value to your property and we can highly recommend Saicos Tropical Combo as the best finish. For those still wanting to change the appearance of their tropical floor: think about adding a light rug to the floor which keeps the value of your floor intact (for instance when you sell your property the new owners could appreciate the original floor more than a stained one) and gives you more of the "design-style" you were after at the same time. Some issues keep recurring in our inbox, on flooring forums: cork strips among them. Thank you for your question. We are trying so hard do tell everyone exactly that: DON'T use cork strips to fill the expansion gap. These were used many, many years ago to divide design parquet pattern and the block border and somehow ended up in the expansion gap. So, you are absolutely right. Leave your expansion gap 'empty' to cater for any natural seasonal movement of your wood floor." Many thanks, it's nice to be right for once! Of course he was right, we still don't understand how the old-fashion cork divider strip ended up as recommendation to fill your expansion gaps. Looking for more tips and tricks of the trade to install your own natural wooden floor like a pro? Look no further than the "Wooden Floor Installation Manual"
with a whopping 20% discount! The E-version: instant access to the exact same content as the the paperback, plus includes all colour images and drawings. gives you even the opportunity to ask your own questions underneath every section, every chapter even. 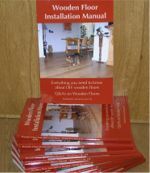 This 160 page manual in plain English contains all the tricks of the trade we and other professionals use which will make your wood floor look like it was installed by a professional too. An UV-oil finish is quite common nowadays. but is sets most people on "the wrong foot". UV-oil means the oil in the factory has certain particles in it that assists the quick factory drying of the oil with UV-light. It does not mean your floor is now protected against the effects of the UV-light of the sun. Treat your floor regularly, enjoy the sun and don't get burned! "We've sanded down our Oak floor and like the pale colour the wood has now. How can we keep this colour?" Before we had to tell every one that even a natural finish (such as Saicos Premium HardWaxOil, available in 4 sheens) would "darken" the wood to its natural characteristic. With Oak this tends to be honey - or yellow, and not the pale(r) colour you see right after sanding. Doing the "wet-finger" test on sanded Oak will show you this authentic colour the boards/blocks will get after oiling. Another innovation from Saicos to keep the wood looking as natural as possible. It’s a Non visible finish. After completely sanding the floor, and you would like to keep the same appearance, you should apply two coats of Saicos Pure Hardwax Oil. Does not yellow over time and easy maintenance with Saicos wash care. Also ideal for Kitchen worktops, doors and furniture as well. If you are looking for a pale look on your tropical floor - for which we highly recommend the Tropical Combo - two coats of HardWaxOil staight on the sanded surface will create a patchy look, due to the fact the tropical wood is oily of its own and the oil in the HardWaxOil will have trouble penetrating to wood as it should. Therefore we do not recommend the pure on these wood-species, use the Tropical Combo and apply the single oil first!